Sri Lanka churned out an unlikely draw in the third Test in Delhi as Roshen Silva (74*) and Niroshan Dickwella (44*) capitalized on Dhananjaya Silva’s hard-fought ton to see off the Indian bowlers. With 36 more minutes to go, skipper Virat Kohli eventually offered a draw that the visitors accepted. Brief Scores : India 536/7 & 246 (Shikhar Dhawan 69, Rohit Sharma 67; Dhananjaya de Silva 1/31, P Gamage 1/48) draw with Sri Lanka 356/9 & 299/5 (Dhananjaya de Silva (retired hurt) 119, Dimuth Karunaratne 74*; R Jadeja 3/81, Mohammed Shami 1/50). 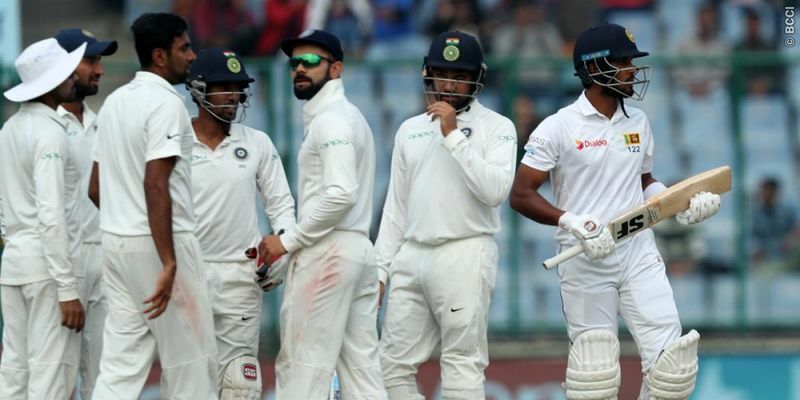 India started the final Test in the strongest way possible with Virat Kohli continuing with his devastating form as the hosts, after winning the toss, opted to bat first. After Shikhar Dhawan was dismissed early and was followed by Pujara, Murali Vijay and Kohli went on to end the day with a healthy 371-run lead, which saw Vijay getting dismissed at 155, while Kohli remaining unbeaten in 156. The skipper, in the process, became the fourth fastest Indian to reach 5,000 Test runs surpassing Rahul Dravid. Lakshan Sandakan’s late brace of Vijay and Rahane ended India’s Day 1 at 371-4. The second day saw Virat Kohli completing his sixth double Test century and reaching his career-best 243 runs. However, the smooth run was hindered by the first ever oxygen-break in cricket’s history as Sri Lankan players struggled to breathe in the poor quality of Delhi’s air. Their demand for repeated breaks broke Ashwin and Kohli’s concentration, who returned to pavilion shortly. An annoyed Indian skipper declared the innings at 536/7, following which Mohammad Shami and Ishant Sharma provided a good start with the new ball. Sri Lanka managed to end the action-packed day at 131/3 with Angelo Mathews and Dinesh Chandimal looking settled at the crease. The third day saw Sri Lanka batting uncharacteristically well with India helping their cause massively dropping three easy catches at the slip. Consequently, Dinesh Chandimal and Angelo Mathews completed their centuries on a smoggy afternoon before Chandimal eventually ran out of partners to bat with. Sri Lanka ended the day at 356/9 with Lakshan Sandakan at the crease with Chandimal. Ravichandran Ashwin and Ishant Sharma were the leading wicket-takers with three each on the third day with Shami and Jadeja following with their respective braces. Chandimal was dismissed early on the next day before India rode on quick fifties by Shikhar Dhawan, Rohit Sharma, and Virat Kohli before declaring at 246 to leave Sri Lanka with a mammoth target of 410 runs in the next 119 overs. However, Sri Lanka couldn’t replicate their first innings’ batting display as they lost three quick wickets in the form of Karunaratne, Perera, and nightwatchman Lakmal with only a few overs remaining. Jadeja struck twice and Shami thrice as Sri Lanka ended Day 3 on a paltry 31/3. Sri Lanka managed earn a draw in challenging conditions on the final day after Dhananjay Silva put on an unbelievable fight, following the dismissals of Chandimal and Mathews, to score 111 runs before he was taken off the pitch due to illness. However, Roshen Silva and Niroshan Dickwella continued to fight right till the end with a much-needed partnership of 68 runs before Virat Kohli decided to offer a draw with 111 runs left on the board with five wickets and 36 minutes remaining. India could manage just two wickets on the last day courtesy of Ashwin and Jadeja claiming a scalp apiece.